Mark Gillan, Williams's chief operations engineer, believes that the FIA should consider changing Formula 1 weighbridge procedures following Pastor Maldonado's 10-place grid penalty in Brazil. Gillan accepted Maldonado's reprimand, which was the Venezuelan's third of the season and automatically triggered the grid penalty. But despite that, Gillan believes that a repeat of such an error could be avoided if teams were notified of weighbridge calls so they could alert their drivers by radio in advance. "It's maybe something that we should discuss in the TWG [technical working group] or on the sporting side for the future because it's in no one's interest for that to happen," said Gillan when asked about the mistake by AUTOSPORT. "It's quite difficult around here, but it's the same for everybody so we take the penalty and move on." 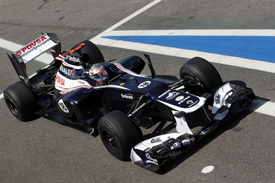 Gillan accepted Maldonado's claim that the red light was difficult to spot having seen the on-car camera footage. He added that it was unusual for a car to be called in after a first Q2 run, which might have contributed to Maldonado not being vigilant enough. "Honestly, he didn't see it," said Gillan. "We reviewed the in-car footage and it is very, very difficult [to see]. The light came on just as he was coming over the brow of the hill. "He didn't have much time to see it and even from the rollhoop camera, it's difficult. "But he did go through it, we can't argue that. "It is unusual in the first run in Q2. I don't remember that happening before." Gillan accepted that it was unfortunate that a relatively minor incident, for which a reprimand is the standard punishment, triggered the 10-place grid penalty, dropping Maldonado from sixth to 16th. He cited Maldonado's clean record since he received penalties for a jump-start and then hitting Timo Glock at the Belgian Grand Prix as proof that his driver has improved. "It's a long time ago and Pastor has had no issues since, so it's disappointing," said Gillan. "He's been quick today."